Little Marshfoot01323 844690work Self-cateringTucked away in the grounds of a former farmhouse overlooking the Pevensey Levels, Little Marshfoot has been designed to promote environmental building techniques and standards whilst at the same time achieving the highest levels of comfort and quality. Fully centrally heated, the light and airy open plan kitchen/diner is fully equipped with fridge freezer, dishwasher, washer/tumble drier, microwave, electric hob and fan oven. Sleeping TWO people, the en suite bedroom has a TV radio/alarm and hairdryer. A CD Player and DVD are also available. The sitting room has a sofa bed to accommodate an extra person at a small extra charge. All bed linen and towels are supplied and there are absolutely no extra charges. 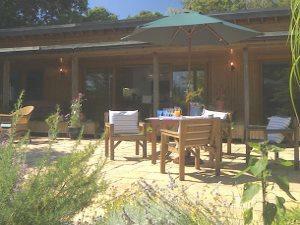 The garden is secluded and is visited by a variety of wildlife, including foxes, badgers and many birds. There is free high speed WiFI and a Welcome Pack awaits guests on their arrival. Little Marshfoot is strictly non-smoking and has ample off road parking. Walkers, cyclists and bird watchers will find plenty to see on the Pevensey Levels and we provide secure dry storage for boots, bicycles and other gear. 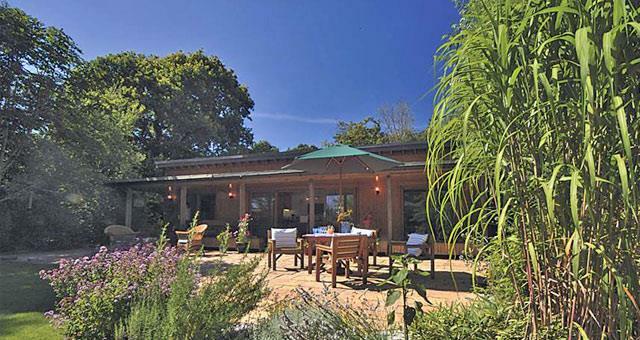 With views out over the fields the south facing ‘loggia’ captures the morning sun and is a delightful location for eating ‘al fresco’ at any time of the day whilst enjoying the mature garden or watching a game of croquet or just the visiting birds and other wildlife. Only seven miles from the sea this secluded and peaceful venue is well located for touring Sussex, Kent and the home counties. Eastbourne, Hastings, Lewes, Tunbridge Wells, Battle, Rye and Brighton are all towns which merit a visit and there is an hourly train service to London from the local station. Tucked away in the grounds of a former farmhouse overlooking the Pevensey Levels, Little Marshfoot has been designed to promote environmental building techniques and standards whilst at the same time achieving the highest levels of comfort and quality. Take A22 to Hailsham & into town centre. After 1/2 mile turn right at mini roundabout. Continue through one-way system in left lane & over next mini roundabout - HSBC bank on left, Lloyds on right - into Market Street, passing market. The road becomes Mill Road. Continue to no. 141 & turn left immediately into farm track which is signed as a footpath (Little Marshfoot Lane). After 250yds turn into parking space by garage where there are a range of tourism signs.